In Paris, boutique hotels have made a comeback. Here are a few we like. If ever there was a city to truly understand the idea of “boutique,” it’s Paris. In large part due to the city’s 19th-century Haussmannian terraces and elegant mansions, the French capital has long been dominated by intimate, richly decorated spaces. (This is to say nothing of its famous palaces.) Traditionally that bijou style has borne out in the small-scale hotels across the city’s arrondissements, which often exude a winsome French antiquity. The last few years have seen the rise of splashy new luxury openings and the arrival of headline-grabbing international groups like Mandarin Oriental, Peninsula, and Shangri-La. To much media applause, the Ritz Paris reopened in June after nearly four years of renovation, yet the hotel, which was at the forefront when it debuted in 1898, remains determined to appear a venerable old lady that never closed. Some of the larger, more extravagant properties, not surprisingly, tend to take a safe approach, marketing Paris’s deep history while sowing the quintessential fairytale vignette (see: the Four Seasons George V or the Peninsula). Increasingly, Paris has seen hotels become more design-minded, with existing spaces adding bars and lounges—and even spas and mini-pools, as at Maison Souquet—to basic offerings. Joining architecture and design stalwarts like Vincent Bastie, Christophe Pillet, and Christian Lacroix are emerging names including Dorothée Meilichzon, Chloé Nègre, Studio NOCC, and Favorite Agency,x who are evolving the boutique model with an often youthful—and decidedly French—twist. Gloaguen brought in Meilichzon for Hôtel Paradis, the designer’s first hotel, in 2012, and the recently opened Hôtel Panache. “I was at the Experimental Cocktail Club in St-Germain, and I asked the barman who designed it,” recalls Gloaguen of how he discovered Meilichzon. “I didn’t expect to find someone so young.” (Gloaguen and Meilichzon are both 33.) Beyond its bars in Paris, New York, and London, the Experimental Cocktail Group has also branched into the hotel sphere with the Grande Pigalle, a “bed-and-beverage” concept again designed by Meilichzon. (A second outpost is slated to open next year in London.) Gloaguen is already working on his next hotel, this one with Nègre, set to open in early 2017. One hallmark of the new breed is their foray into offbeat districts beyond the mainstream business and tourist quarters, a trend that began in 2006 with André Saraiva and Thierry Costes’s Hôtel Amour in South Pigalle (SoPi) and continued in 2008 with the first Mama Shelter, designed by Philippe Starck, in northeastern Paris. Another stamp? The colonization of unexpected buildings. Jules et Jim in the Marais is a rare combination of new construction, an historic silversmith’s workshop, and a courtyard with a planted wall and outdoor fireplace; Hôtel Edgar and Le Fabric occupy former clothing workshops; Ekta, Renaissance République, and the Generator Paris are in converted 1970s and ’80s office blocks; and at Le Cinq Codet duplexes benefit from the high ceilings of a 1930s telephone exchange. One of the most palpable attributes of Paris’s small hotels is the craftsmanship that is nearly impossible in places with high key counts. Cases in point: Hôtel Nell, designed by Jean-Michel Wilmotte, with its Japanese-style baths carved out of blocks of marble; and the belle époque Hôtel Vernet, where designer François Champsaur worked with local artisans on the sensual curved oak doors, and called upon artist Jean-Michel Alberola to paint the ceiling. Each of the 18 rooms at Hôtel Providence, conceived by Elodie Moussié, who’s married to the nightlife magnate owner, and her friend, has a custom marble-topped bar with built-in ice maker. Or take Jean-Philippe Nuel, who often collaborates with photographers and has revisited the Hôtel Général that he first did a decade ago, personalizing its corridors with portraits of the design team, locals, and hotel guests. Like Paris’s hotel scene writ large, the project is a rich work-in-progress that will surely evolve in unexpected ways. Here, we round up six new standouts capturing our attention. Herringbone oak parquet paneling the walls and floor, reinterpreted here in dark blue, is the standout feature at Amastan. Located on a quiet side street off the Champs-Elyées, Juan Pablo Naranjo and Jean-Christophe Orthlieb of Studio NOCC teamed with owner Zied Sanhaji on the two-year project, where they cleverly play with light and shadows. Illuminated shelves stocked with antique books are punctuated by glass vases and ceramics by NOCC and other designers, like Jean-Baptiste Fastrez. Golden hues luminesce from a lobby tapestry by German designer Jan Kath. Sunlight pours in from the glass-roofed bar onto the brass bottle display at the rear, opening on to a jasmine-strewn courtyard dotted with rock blocks that double as makeshift seating for guests. An impressive attention to detail is prominent throughout the space: the congruent alignment of the parquet floors and walls, the Carrara marble bar that darkens from pale to dark gray. White minimalism meets the parquet in each of the 24 rooms, several of which feature ever-polarizing glass-walled bathrooms. The aim from the onset was to create something singular. “The wood and bronze desks were created specially for here,” Naranjo says. While Sanhaji extols the virtue of permanence, as evidenced by the commission of London-based Campbell-Rey for the visual identity of his nascent brand that is, he says, “elegant but unpretentious.” That means taking a long view in lieu of chasing the latest fads, and catering to Paris residents as well as visitors. One way to accomplish that is through the use of malleable spaces. While the bar serves as a lounge and library for guests during the day, at night it transforms into a neighborhood cocktail joint, complete with its own street entrance. Up-and-comer Dorothée Meilichzon—she was the Designer of the Year at Maison & Objet Paris in September 2015—has a real eye for pattern. At Hôtel Paradis, which debuted last year, she employed some 57 different wallpapers throughout the interiors. For her next act, she’s dispersed a patchwork of motifs across the carpets, tiled floors, and walls of the new art nouveau-style Panache, in Faubourg Montmartre near the Grands Boulevards. It’s an astute visual solution to the complicated triangular floor plan of the corner building (New York’s Flatiron Building was one of Meilichzon’s references). The 40 rooms are akin to an assorted bag of jelly beans, each one dissimilar in shape and size—some have annexed sections of the corridors or asymmetrical alcoves around the stairwell. Miniature lounges, triangular sofas, and geometric mirrors make for an idiosyncratic design that gets added style points for steel-and-cane headboards and some Meilichzon favorites like vintage telephones and Bauhaus light switches. The ground-floor modern bistro is run in partnership with restaurateur David Lanher, whose innovative concepts that rethink classic French cuisine have earned him a devout local following—the reason the Parisian clientele suspend their apprehension to hotel restaurants and pack the place nightly. “Be Welcome Be Happy,” a glowing glass text work, hints at the laidback, bohemian atmosphere of the C.O.Q., meaning “Community of Quality.” Opened earlier this year in the emerging 13th Arrondissement, it’s the first hotel by Pauline d’Hoop and Delphine Sauvaget of Favorite Agency, two young graduates of ENSAD decorative arts school known for their string of hot-spot restaurants. The space is an amalgam of their own creations, French oil paintings, 1950s Danish furniture, Charlotte Perriand wall lamps, Italian vintage pieces, and contemporary photos in what owner Michel Delloye dubs “the spirit of a Parisian home, combining elegance and the ‘cool attitude.’” The ground floor flows from a shop-style breakfast café to a library bar and glass-roofed conservatory, where cascading plants rest on grated metal shelves alongside globes and board games. Upstairs, the 50 pared-back rooms are done up in muted tones and celebrate local artisans, mixing modern furniture and floors crafted in Limoges—a medieval western French village known for producing cognac-aging oak barrels—with merino wool throw blankets by homegrown textile outfit D.U.S.T. and forbidding period portraits sourced from nearby flea markets. The bathrooms play on the graphic contrasts of white tiles and black clawfoot tubs. The result is an eclecticism that embodies the new strain of design thought streaming through Paris right now. The cockerels in the onsite chicken run, for instance, might just lay the breakfast eggs. How do you revitalize a place that was a legendary 1980s and ’90s Marais nightclub—and before that, a public bathhouse opened in 1895 where Les Halles market workers mixed with the intellectuals of the day—into an upmarket hotel that stays true to its essence? For its owner, the film producer Jean-Pierre Marois, the answer was to make it comfortable, keep some of the nighttime spirit, and add the slightly schizophrenic input of two very different interior designers: Denis Montel for the downstairs bar and restaurant, and Tristan Auer, a favorite among the stars (see: Mick Jagger’s château), for the rooms. Key elements from the past were also preserved: reception desk for the concierge, chinoiserie lounge, and black-and-white mosaic floor from the early Philipe Starck design in the club and its scandalous basement mini-pool. Tucked inside architect Vincent Bastie’s impeccable Haussmannian facade, the 39 rooms and suites lead off wide landings with art displays and carpet modeled on singer Serge Gainsbourg’s Paris flat; those at the rear have wooden-decked balconies. Highlights of the surprisingly understated look include rust-colored corner banquettes and burnt orange Warhol-inspired sofas. Public spaces take guests on a journey across the mood spectrum. The low-lit restaurant, with a centerpiece U-shaped bar, undulating red lacquered ceiling, and dramatically layered felt wall installation, divides opinions amongst the locals, but is popular with the fashion coterie (Givenchy and Dior have hosted Fashion Week parties there). The subterranean boîte, with its checkerboard floor and mosiac-tiled walls, has regained its buzz. Across the street, a light-filled gallery-boutique stocks limited-edition pieces handpicked by Thomas Erber of local favorite Cabinet of Curiosities and hosts temporary instillations. 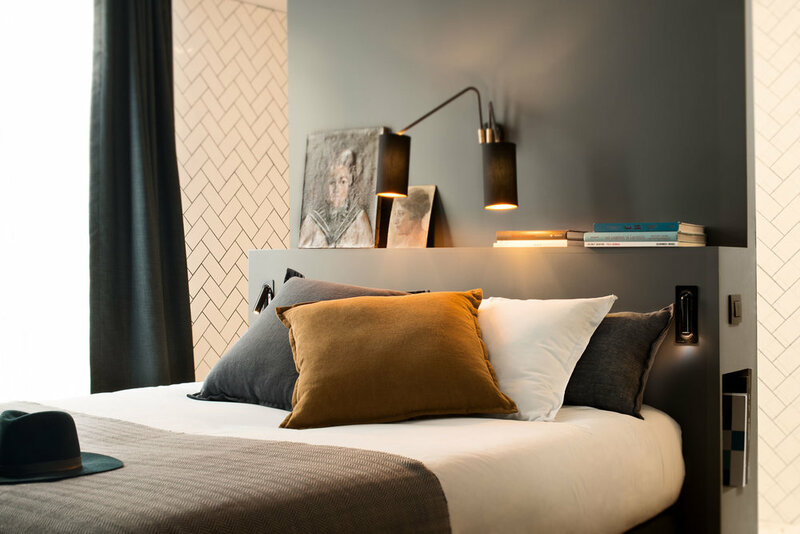 Situated on a historic rue between Opéra and the Louvre is the first Paris hotel by French interior designer Sarah Lavoine, who’s better known for her furniture, tableware, and ceramics. Naturally, then, a residential sensibility permeates Le Roch, which takes inspiration from its Saint-Honoré district location. “It’s my neighborhood, where I live and work, and where my son goes to school,” Lavoine says. “I wanted it to feel like a home.” Her vision is reflected in the subdued pastels and homey touches that outfit the spaces: the sage-hued lounge with its charcoal sofas, fireplace bordered by art books, and colorful Pierre Frey carpets designed by Lavoine; and the milky velvet chairs and cheerful lamps at chef Arnaud Faye’s seasonally-focused restaurant, which opens onto a quintessentially European courtyard. The rooms evoke well-appointed pied-à-terres, each one coming in a variation of petrol blue, smokey black, and white Ressource paints, with Cassina chairs and walnut floors. Upholstered headboards echo Lavoine’s sofas in the four suites, which have tiled emerald hammams and Kaldewei bathtubs. Also on hand, the ultimate accoutrement of the monied class: an onsite voiturier at the ready. The 18th-century Hôtel de Choiseul building—at different times the headquarters for the era’s newspaper, Le National, and an aristocratic Italian restaurant—is the cast for Milan-based design duo Emiliano Salci and Britt Moran of Dimore Studio’s fashionable Hôtel Saint-Marc, on a corner block beside the Opéra Comique (currently under restoration). The firm’s work has been celebrated for burnishing older periods with shiny new polishes. Here, it’s an art deco take on the interior, though the result, with its loud patterns, eccentric bits of sculpture, glitzy mirrors, and shiny marble reception desk, is curiously more ’70s than ’30s. You almost expect to see Gary Glitter wandering about the lobby. The surprise includes the selection of enormously varied colors and fabrics in the 26 rooms: dark green, sky blue, mustard yellow, cherry red, graphic tweed curtains, and satiny foliage prints. Dedar velvet armchairs and Fontana Arte lamps pair with polychromatic zigzag O. Borsani headboards for a reinterpretation of the deco age through Dimore’s lens. Another ode to the style’s exuberance awaits beneath the surface of the 2nd Arrondissement, where a covert pool and hammam outfit a low-lit space.